Mill-Max has added to its diverse mix of press-fit pins for plated through-holes with six new offerings designed for applications where mechanical strength and/or power delivery are essential. These new PCB pins feature multi-faceted (polygon) geometries and are suitable for solderless PCB termination or for direct soldering to the board for those situations requiring it. When these pins are pressed into a plated through-hole the points (the major or circumscribed diameter) of the polygon are set or imbedded in the hole while the flat sides of the feature (minor or inscribed diameter) provide relief, allowing the remainder of the plated through-hole barrel to remain intact. The result is internal board layers are not disconnected when the pin is pressed in. 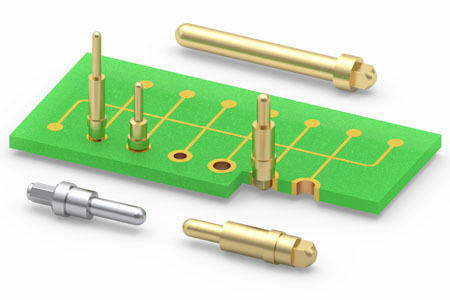 With a properly specified hole size, the polygon shaped press-fit feature will allow the pin to be secured in the hole while maintaining continuity throughout all the layers of the PCB. Mill-Max employs its machining expertise to manufacture either square or hexagon shaped press-fit features to suit a variety of hole sizes and assembly requirements. Square press-fit features normally leave a larger gap between the flat side of the feature and the hole, useful for solder flow and venting of gasses, while a hexagon feature will provide more interference and greater retention. You can find more information on this topic in our Application Note: Press-Fit Pins and Receptacles for Plated Through-Holes. The pins featured in the table above are often used in applications with more demanding mechanical/electrical requirements such as power supplies, power converters and any device subject to blind mating or rough handling. They are typically staked into a PCB at the press-fit end and either soldered or plugged in at the pin end. The smallest pin diameter in the group is .040” while the largest is at .080”, typical sizes for DC-DC converters. These pins are suitable for high current applications, the limits of which depend on the temperature requirements and heat sinking abilities of the environment. The pin material is typically brass but for greater electrical conductivity and more efficient heat dissipation tellurium copper is also available. Some of these pins include vent features to facilitate soldering. Vents may be located at the base of the body above the press-fit feature for press-fitting before soldering. This is sometimes preferred to control perpendicularity, to prevent float during the assembly process, to provide additional mechanical strength or for high current applications. When vents are located at the pin end, they are useful to end users of the device needing to solder the component to their board. Vents can be machined at both locations if the application requires it.